Pulsar hiper-denso contradiz Teoria de Einstein? Não! Em Ciência, não se viabiliza uma observação, não se explica um fenómeno, muito menos uma causa, só porque alguém disse que acredita ter observado determinada pegada, ou efeito. Têm que se registar outras observações independentes que obtenham os mesmos resultados. Mas o que vem a ser isto de Ondas Gravitacionais? São ondas de choque, muito débeis, extraordinariamente difíceis de detetar, que estão previstas pela Teoria Geral da Relatividade, de Albert Einstein. No modelo do Big Bang (em termos formais designa-se por Lambda Cold Dark Matter model) o início dos tempos terá sido marcado pela Inflação, uma fase muito curta do parto do Universo em que este terá crescido, qual super-bebé, muito mais rapidamente do que a velocidade da luz. Ora esta fração diminuta da fabulosa história do nosso super-bebé é a parte mais frágil do modelo do Big Bang, outrossim confirmado por milhares de observações e de experiências. Por isso mesmo o Big Bang é o modelo de consenso entre a maioria, que não todos, os cientistas. As ondas gravitacionais terão sido geradas pela Inflação e, cerca de 380 mil anos depois (o nosso super-bebé arrefeceu e libertou a primeira luz, até aí presa num caldo muito espesso e muito quente de comida recomendável para bebé) terão deixado as suas marcas nessa luz. Essa luz chama-se radiação de fundo do Universo, é muito velhinha, muito querida dos cientistas e está, naturalmente, muito fraquinha. É adorável. Essas ondas foram geradas numa tremenda convulsão chamada inflação, e deixaram uma marca muito leve nessa luz. Ora é essa marca, essa pegada (portanto é uma observação indireta) que os cientistas do telescópio BICEP-2 revelaram ter detetado. Um detalhe: o BICEP-2 é de facto um instrumento muito sofisticado desenvolvido pelo MIT e posto no Telescópio do Polo Sul, na base Scott-Amudsen. As ondas gravitacionais deixam a sua pegada na radiação de fundo do Universo, com estes padrões retorcidos. Mas, outros cientistas com telescópios mais poderosos contradizem a observação, dizem nada ter detetado e que se deve tratar duma interferência da zona do espaço sob observação. Temos uma observação, que formula uma hipótese, e que carece de confirmação. Temos a publicação dos dados e a sua revisão pelos pares. Temos Ciência, séria, honesta, no seu melhor. Quando damos estas notícias, como o fizemos, há equilíbrio difícil entre o entusiasmo e a sobriedade. Por norma, deve-se optar pela sobriedade. Por emoção, deve-se dar largas ao entusiasmo. O entusiasmo aqui é de se ver a Ciência no seu melhor, a colocar-se a si própria em dúvida, em questão. Com mais observações da mesma zona do espaço, desta feita pelo telescópio Planck, haverá lugar a refutação ou a confirmação. Einstein, que adormeceu para sempre a estudar, esse Estudante fabuloso, apreciava sobremaneira esta forma de fazer as coisas. E, tanto quanto julgo saber, também apreciaria que demonstremos respeito pelos cientistas envolvidos neste excelente Debate. Para finalizar, isso traduz-se numa coisa muito simples: respeito pelos nossos leitores. The claim made headlines worldwide, hailing one of the biggest scientific discoveries in decades. Last spring’s press conference, organized by John Kovac from the Harvard-Smithsonian Center for Astrophysics and his colleagues, was abuzz with excitement. Weeks after the initial results were released, however, other scientists began to spot holes in the team’s analysis. It didn’t take long before researchers and the news media alike criticized the team for making a premature announcement to the press before its work had been peer-reviewed for publication. Then in September, it became clear that the BICEP2 team underestimated the confounding effects of dust in our own galaxy. And today, with the European Space Agency’s confirmation, it’s official. Some researchers recall the blunder with cosmic embarrassment. No one seems to mind that the results weren’t spot on, given that this happens in science all the time. Their real beef is that the BICEP2 team went live before the results had been checked over by outside experts. Although many argue that the unfounded hype harms the public’s perception of science, I think the contrary is true: this episode is actually good for science. It helps the public understand that science is a process and even see that process in action. But this idea is a strikingly new one. “If you follow the book, in science you have to be extremely careful about data – especially very controversial data – because the stakes are so high,” says astronomer Marcelo Gleiser from Dartmouth College. Although the results have no impact on our everyday lives, the stake in this case was their promise of unraveling the origins of the universe. But today it’s harder than ever to keep data under wraps. In the Internet era, unintentional leaks can quickly let the cat out of the bag – as seen in today’s own developments. In other instances, especially in the physical sciences, researchers put their papers on publicly accessible pre-print servers before any formal review, so that their results can be seen and discussed by a wider audience. Press conferences and social media further amplify this public dissemination. 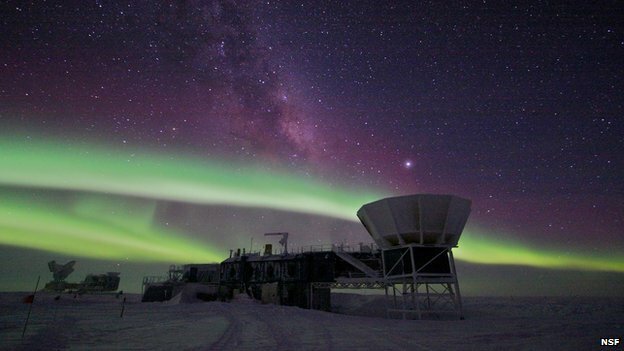 The BICEP2 team strongly defends going public before publication. “We submitted the paper the day we announced it,” says team member Jamie Bock from the California Institute of Technology. Indeed the BICEP2 team was by no means the first research group to share its results at a time that is arguably too early. In 2011 European physicists announced they had clocked a group of subatomic particles, known as neutrinos, traveling faster than the speed of light. The claim, which stood in defiance of Einstein’s special theory of relativity, was in turn publicly disputed and finally rejected. “In a way both of those episodes are large-scale, particularly visible, particularly striking, versions of what happens in science all the time,” says Philip Ball, a freelance science reporter who worked at Nature for over 20 years. But making this process more visible might have unintended consequences, contends Gleiser. Many researchers draw a parallel to climate change denialism, arguing that these episodes come at a time when the Earth is under threat and scientists can therefore ill-afford attacks on their integrity. But the fact that science is under attack can equally support further transparency. “This kind of incident ought to be something that strengthens people’s understanding and appreciation of science rather than the reverse,” says Ball. It’s a debate that’s not settled, leaving scientists to increasingly have to decide how to handle controversial results. Do they hold back claims until they’re accepted for publication? Until they’re confirmed by another research team even? Or do they let the public listen in on a lively debate? In the end, science is a human endeavor. This latest incident is a reminder that scientists are constantly engaged in a tightrope-walk between astonishing claims and careful deliberation. Sometimes the result rewrites the laws of physics, and sometimes it’s much more nuanced. But as a whole, science seeks to embrace mind-warping new concepts. So by revealing their initial results to the public, researchers provide an early glimpse into this thrilling quest. “It seems a shame not to share that,” says Ball. It is important to note, however, that this null result doesn’t disprove the existence of gravitational waves, it just confirms, to a high degree of certainty, that BICEP2 hasn’t detected gravitational waves — yet. 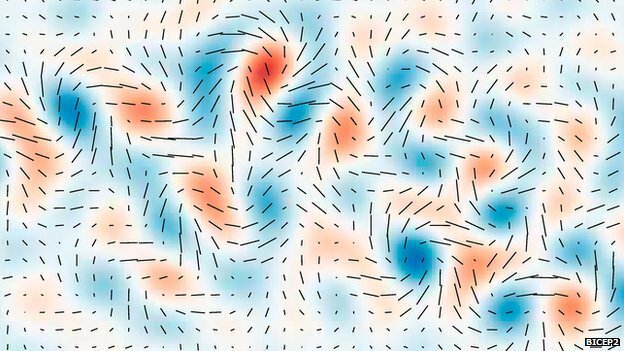 “While we haven’t found strong evidence of a signal from primordial gravitational waves in the best observations of CMB polarization that are currently available, this by no means rules out inflation,” said Reno Mandolesi, principal investigator of the LFI instrument on Planck at University of Ferrara, Italy. There’s also the possibility that the gravitational wave signal is in the BICEP2 data, but it is just swamped in the noise, so this new result places an upper limit on the possible strength of B-mode polarization caused by gravitational waves. “The gravitational wave signal could still be there, and the search is definitely on,” said Brendan Crill, of both the Planck and BICEP2 teams from NASA’s Jet Propulsion Laboratory in Pasadena, Calif.
Um novo mapa da poeira interestelar reduziu muito a probabilidade de que o BICEP2 tenha detectado ondas gravitacionais. Eu concordo. A ciência tem sempre dúvidas, mas está sempre a procura rconfirmá-las ou corrigi-las. É a sua excelência perante as pseudoevidências que todos os dias nos são apresentadas. Eu acho que não se deve dizer ” perante este facto começo a acreditar”, mas antes “vou procurar confirmar analisando experiências semelhantes”. Isto resulta de conversas que vou tendo com pessoas que defendem muitos fenómenos que já aqui têm sido esclarecidos. Eu recomendo-lhes muitas vezes o AstroPT.